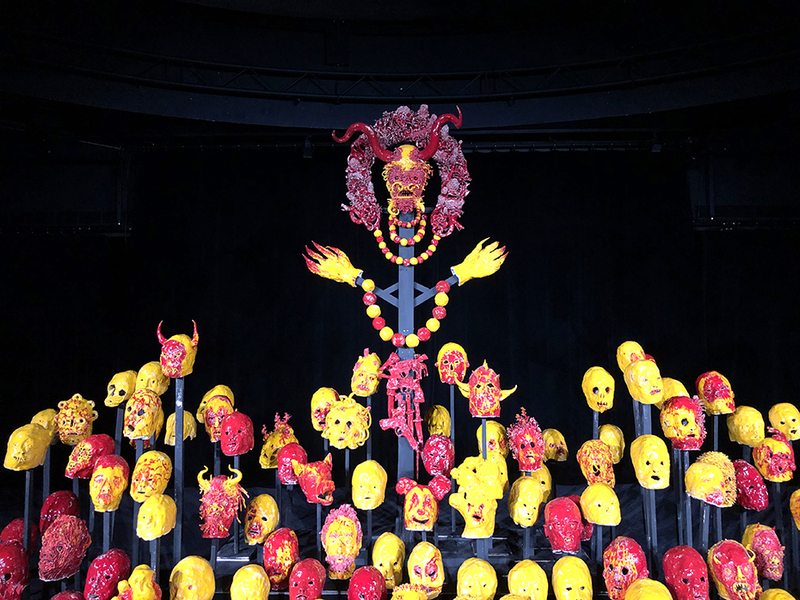 Howie Tsui ‘s Retainers of Anarchy, a 25-metre scroll-like video installation, is traveling to its next exhibition at the Ottawa Art Gallery – Galerie d’art d’Ottawa, from April 12 to September 15. This is collaboratively organized by the Vancouver Art Gallery, Art Gallery of Great Victoria and the Ottawa Art Gallery. 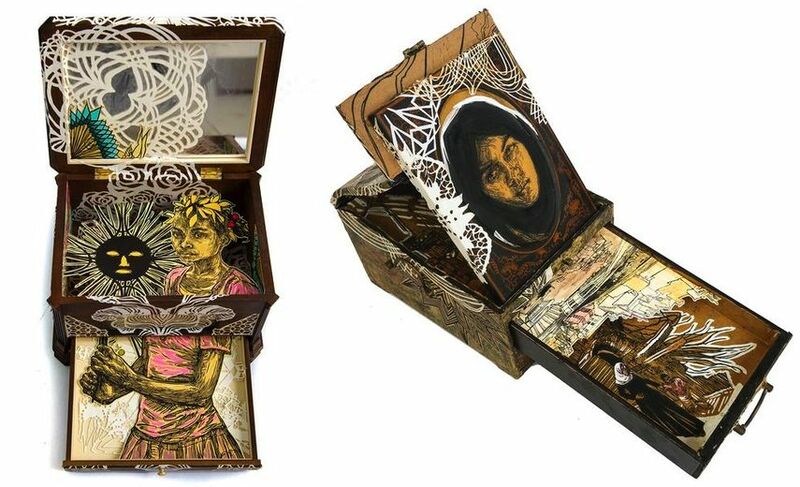 Caledonia Curry (aka Swoon) is an acclaimed mixed media artist who became known for her street art in the late 90s. She has since expanded into large-scale installations and explores the relationship between people and their built environments. Her mission is to use art to rebuild communities and humanize today’s most pressing social and environmental issues. You can discover and experience her beautiful work all around the city of New York. You mentioned in an interview in May of last year that you are interested in venturing into experimental film. Have you started to explore that genre? What new projects are you most excited about in the upcoming year? Yes, totally started exploring! It’s incredibly fun to add the dimension of time to the visual language I’ve been building for the last 20 years. It makes me realize how much narrative already exists within my work. I’m just excited to take some time this summer to keep exploring. It’s all an experiment at this point. How have you used social media and/or online tools to benefit your artistic practice? What are your favorite and least favorite aspects about engaging with the internet as an artist? I was surprised to learn that I love social media. I avoided it like the plague for years, until one of my studio assistants started an Instagram account for me as a parting gift when she was leaving the studio to focus on her jewelry making career. I guess it had been really useful for her and she wanted to share the good. Slowly I started posting, just bits here and there, but then eventually I realized that I am such a communicator – it’s in every fiber of me to want to express ideas and images, and so the more I shared, the more rewarding it became. I can really work through ideas and share big pieces of who I am through my channels. And it helps me support my studio and projects through being able to announce print releases or Kickstarter campaigns. My least favorite thing are the trolls – it takes practice to remember that some people are just puking out their nastiness and suffering onto the world through these channels too, and not to take it personally. “Thalassa” at Contemporary Arts Center, Cincinnati. Photo courtesy Tod Seelie. Can you tell us a bit about the methods you use to to fund your work? We know you’ve run a couple of Kickstarter campaigns via your non-profit, The Heliotrope Foundation — what was your experience with this method of funding? What other funding methods have you found effective for your artistic practice? I’ve been incredibly fortunate to have a strong art market around my work, which really got traction through my show with the gallerist Jeffrey Deitch back in 2005. When I very first started to support myself through art (rather than waitressing), I would sell prints out of my apartment to people who found me online through a website some friends had included me on. Then for a while after my work started to sell more widely I spent all of my money on community based projects, but eventually that became unsustainable and so I started an organization and started hosting events and throwing Kickstarter campaigns to fund the projects. These things take A LOT of energy, and it’s easy to spend so much making the rewards that it feels like there’s never enough for the project. We also run a print site where I trade artists a piece of my art for the use of one of their digital images, so they get art, as well as supporting our work in Haiti for example, and that has been a strong source of stability for Heliotrope over the years. “Yaya and Sonia with Amanda and Moni Jewel Boxes” from Chandran Gallery, San Francisco. Courtesy of Margaret Austin Photography. Speaking of The Heliotrope Foundation, what have you learned from creating and managing a non-profit organization? What advice would you give to someone who wanted to start their own? I have found that my friends, and my closest collectors, people I know fairly well are still Heliotrope’s biggest supporters. Even when the base for a project grows, it’s still the people who know you and care about the work who will be the core of it – so start with that in mind. Ask yourself who gets you, who believes in what you are trying to do? Start building together from there. As an artist who balances so much — from institutional shows to creating personal work to organizing social impact projects — how do you stay organized and manage your time effectively? Delegating is everything. Finding a good team and trusting people to do their jobs well. Even when I was a waitress I would occasionally hire people to help me with aspects of my art. Even on my tiny waitressing salary, it was still that valuable to get help sometimes. Also clearing some days or even weeks with no meetings to just focus on art making – to be able to shift into uninterrupted creative mode. Trusting your instincts about when to go ahead with a project and when to pause. Morning meditation helps a lot too. Helps me get stable to handle the day ahead and whatever it’s gonna throw at me. “Medea” at Contemporary Arts Center, Cincinnati. Photo courtesy Tod Seelie. Caledonia Curry, who exhibits her artwork under the name SWOON, is a classically trained visual artist and printmaker who has spent the last 14 years exploring the relationship between people and their built environments. Her early interventions in the urban landscape took the form of wheat-pasting portraits to the walls of cities around the world, and her public practice has expanded to using art to rebuild communities and humanize today’s most pressing social and environmental issues. She co-founded Konbit Shelter in 2010, an artist’s response to the devastating earthquake that struck Haiti that same year. Other community-based endeavors include collaborating on the construction of musical architecture in New Orleans, and a neighborhood revitalization project in North Braddock, PA. Alongside her place-based work, she has a studio practice of drawing, printmaking, architectural sculpture, and installations. Curry’s work has been collected and shown internationally at galleries and museums, including the Museum of Modern Art, New York; the Brooklyn Museum; the Institute of Contemporary Art, Boston; and the São Paulo Museum of Art. Le nouveau numéro du magazine américain Juxtapoz consacre une grande interview de 5 pages à SWOON et à son travail récent. Elle y parle de ses récentes recherches en stop motion ainsi que les thématiques qui lui tiennent à coeur en ce moment, notamment sur l’addiction et l’art comme catharsis. The new issue of Juxtapoz features an extensive interview of SWOON on 5 pages dedicated to her recent work and researches. She speaks about her latest developments in stop motion design as well as subjects that matter for her such as addiction and art as catharsis. 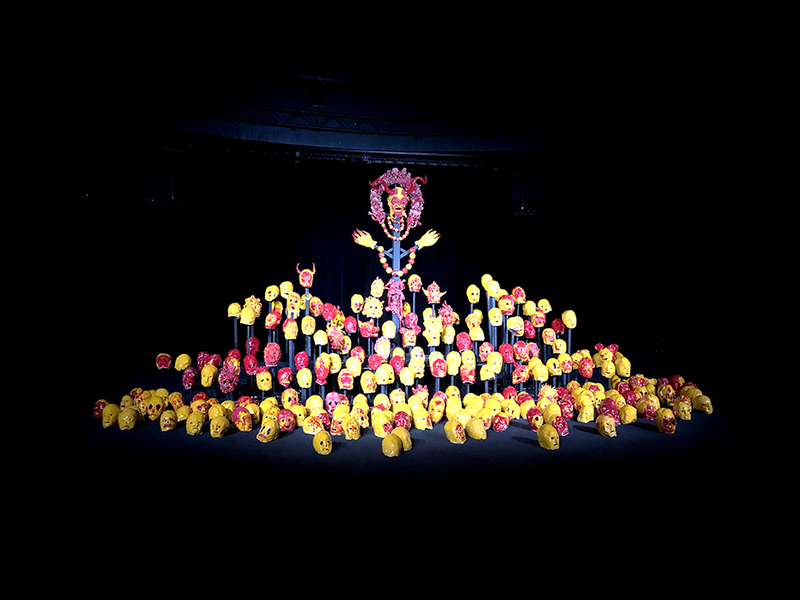 Installation et céramiques présentées les 23-24-25 novembre 2018 à Eléphant Paname, Centre d’art et de danse, 10 rue Volney, Paris 8e. Aujourd’hui n’est pas un jour comme les autres. Ce matin, nous nous sommes réveillés avec des traces de rêves imprimées sur la rétine. Un souvenir lointain de découverte, une envie incontrôlée d’explorer de nouveaux territoires créatifs. Songe prémonitoire ou coïncidence, cela reste encore un mystère. Une chose est sûre, notre rencontre avec Étienne Pottier est sur le point de combler notre besoin de nouveauté. C’est au cœur du 17ème arrondissement que nous avons rendez-vous avec Étienne, artiste touche-à-tout, dont la dernière passion en date n’est autre que la céramique. Entre ses mains naissent les reliques d’un monde parallèle hanté, inspiré de la réalité quotidienne. Armures, masques, talismans et créatures chimériques habillent les recoins de l’atelier parisien, transformé en un véritable sanctuaire païen aux multiples influences. Entre contes, légendes et spiritualités contemporaines, Étienne développe, sous le regard de ces progénitures, un univers composite où l’utilisation des symboles est la clef de voûte. Au centre de sa meute artisanale, le jeune artiste est un loup meneur qui attaque et défend son territoire par le feu de la création. Pas à pas, tout en restant sur nos gardes, nous nous préparons à entrer dans un monde onirique peuplé de créatures hybrides aussi sombres qu’intriguantes. 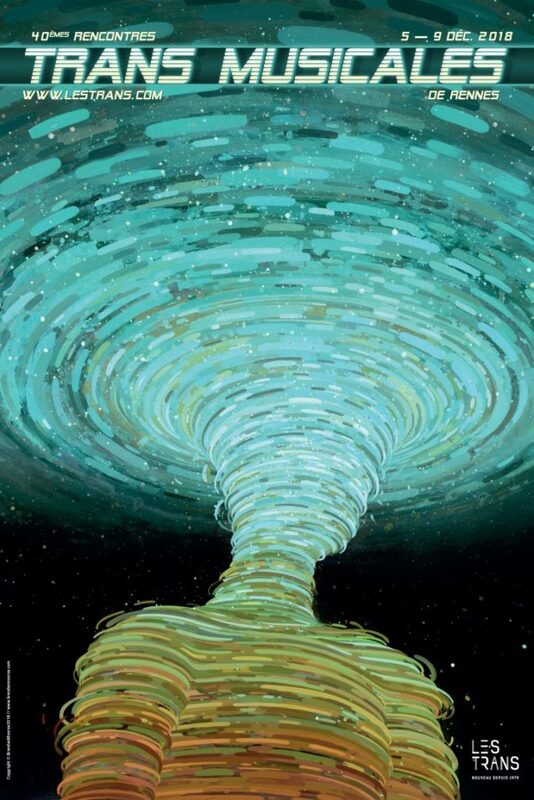 Hypnotisés par les reflets de l’émail et charmés par l’atmosphère du lieu, nous fermons les yeux et nous laissons emporter. À quel moment as-tu eu ton déclic créatif ? Autrement dit, quand est-ce que tu as réalisé que tu souhaitais faire de ta passion un métier ? Étienne : La fameuse question de la vocation artistique ! À vrai dire, si je regarde un peu en arrière, je dirais que c’est un mélange de choses qui me sont arrivées et d’envies qui m’ont suivi au fil des années. Je me revois par exemple en primaire, au fond de la classe, en train de faire des dessins avec un ami à moi. Au-delà de cette affinité pour le dessin que j’ai développé très jeune, je pense que mon attachement à l’Art s’est renforcé grâce au soutien familial dont j’ai bénéficié. Quand j’étais au lycée, j’étais plutôt un cancre. Au fur et à mesure que mes notes diminuaient, ma mère a compris qu’il fallait que je m’oriente vers la seule discipline dans laquelle j’avais un savoir-faire : le dessin. C’est un peu comme ça que tout à commencé. Peux-tu nous parler des étapes de ton cheminement artistique ? Étienne : On va dire que j’ai commencé par le dessin et que c’est en quelque sorte mon médium de prédilection. Au cours de mes années aux Arts Décoratifs de Paris par exemple, j’ai réalisé un roman graphique qui a eu la chance d’être édité. Par la suite, j’ai complètement arrêté la bande dessinée car j’ai compris que je n’étais pas intéressé par l’écriture de scénarios mais bel et bien la création d’images. Je suis convaincu que le dessin est la base de tout. Finalement, chaque projet, quel que soit le support, nécessite un dessin préparatoire. C’est automatique, quand j’ai une idée, je ne pose pas des mots dans un carnet, je réalise un croquis en quelques coups de crayons. Au sortir des Arts Décoratifs, Étienne est plus que jamais avide de connaissances et d’expérimentations. L’artiste qui sommeille en lui n’est pas encore certain de ce qu’il veut accomplir. Une chose est sûre : il veut créer, donner vie à un univers qui lui est propre. Étienne : Après mes études, je me suis pas mal perdu. J’ai exploré beaucoup de pistes, sans pour autant avoir une révélation. J’ai touché du doigt la bande dessinée, la gravure ou encore la photographie tout en continuant mes recherches en parallèle. Pendant cette période de doutes, j’ai énormément tâtonné, fait de nombreuses erreurs, produit des œuvres qui ne verront certainement jamais le jour. Comment est-ce que tu as découvert la céramique et qu’est-ce qui t’a donné envie d’essayer ? Étienne : Tout est parti d’une rencontre. Une copine m’a demandé de l’accompagner à Saint-Denis dans un atelier où elle pratiquait elle-même la céramique. Cet après-midi là, j’ai rencontré le créateur du studio et très vite il a compris mon intérêt pour cet art. Dans la foulée, je lui ai demandé si je pouvais travailler chez moi et ramener mes pièces là-bas pour les cuire. En quelques mois seulement, j’ai acheté un gros four de cuisson que j’ai installé dans son atelier et au fil du temps on est devenu amis. C’est assez drôle de se dire que sans ce concours de circonstance je ne ferais certainement pas de céramique aujourd’hui. Qu’est-ce qui te plaît dans le travail de la céramique ? Étienne : La céramique m’attire depuis très longtemps mais je n’ai sauté le pas que très récemment. Avec un peu de recul, je pense que je me suis trop enfermé dans ma pratique du dessin. Cependant, à partir du moment où j’ai commencé à travailler la terre, j’ai tout de suite compris que j’aimais créer des éléments en volume. Ce qui me plaît c’est la liberté que je ressens quand je réalise des objets en céramique. Ils peuvent être portés ou simplement être posés sur une étagère mais dans tous les cas, ils vivent et font vivre la pièce dans laquelle ils se trouvent. Je n’abandonne pas pour autant l’illustration. En ce moment, d’ailleurs, je suis dans une période où je mélange les pratiques et les supports : je me sers de la céramique comme toile et je dessine directement dessus. Quand on regarde ton travail, on peut parfois avoir l’impression qu’il est sombre. Est-ce que tu es d’accord avec ce constat ? Étienne : C’est un sujet assez complexe. En effet, j’ai de moins en moins envie de tendre vers une certaine forme d’obscurité. Cela peut paraître paradoxal, mais je suis quelqu’un de très solaire, même si cela ne se voit pas toujours dans mes œuvres. Je pense que la noirceur me vient de mes influences et, qu’étant imprégnée au plus profond de moi, elle revient au galop, sans que je puisse m’en rendre compte. C’est à la fois quelque chose que je combat et quelque chose que je cultive. Plus jeune, j’ai été bercé au black métal et j’ai même fait de la batterie dans un groupe au lycée. À l’époque, on était à la recherche de la provocation, comme avec nos t-shirts à l’imagerie toujours plus trash, toujours plus choquante. Par la suite, j’ai continué à me construire dans la sphère punk, puis dans les free parties, des univers résolument rebelles et libertaires, sans limites et parfois autodestructeurs. Je suis convaincu que cette partie de moi, vécue dans ma jeunesse, est toujours en vie et me suis dans mon processus de création. Au fond, je recherche simplement l’émotion. Quel est le message qui se cache derrière tes œuvres ? Étienne : De manière générale, je n’aime pas expliciter ce qui peut subsister derrière mes créations. D’ailleurs, je ne sais même pas si cela serait concrètement faisable. En effet, dans le temps de production, je pense à un million de choses et un million de choses me traverse l’esprit. Plus je crée plus j’apprends à me connaître. Résumer une œuvre ou un ensemble d’œuvres me paraît fondamentalement réducteur. J’aime beaucoup cette phrase d’un humoriste qui synthétise ma position sur ce sujet : “Expliquer l’humour c’est comme disséquer une grenouille, on apprend plein de choses mais à la fin la grenouille est morte”. Je suis pour la liberté d’interprétation et je préfère que chaque personne se construise sa propre opinion. Chacun voit ce qu’il a envie de voir. À partir du moment où l’œuvre est sujette à des regards extérieurs, son sens ne m’appartient plus. En quelque sorte, elle devient libre à son tour. L’imagination est collective et c’est cela qui me plait. Qu’est-ce qui influence ton travail au quotidien ? Étienne : Je pense qu’être artiste au 21ème siècle c’est assumer le rôle d’éponge de ce qui se passe au sein de notre société. On absorbe ce qu’on voit sur internet, dans les médias et dans notre quotidien. Finalement, on ne crée pas de la même façon d’une décennie à l’autre car le contexte global dans lequel on évolue est en perpétuel mouvement. Créer c’est ingurgiter des fragments de la société moderne et les régurgiter en une matière nouvelle. Je me sers des conflits, des symboles religieux, de l’actualité et même parfois des codes de la pornographie pour donner naissance à mes œuvres. Tout me parle et m’inspire. C’est peut-être là où je m’inscris en faux par rapport à bon nombre d’artistes contemporains qui, aveuglés par une forme lascive de premier degré, cherchent à tout analyser et tout expliquer. Personnellement, je préfère considérer mon travail comme une expression poétique et visuelle de la réalité. La poésie c’est quelque chose qui nous échappe, c’est une sorte de mystère qui, même avec tous les efforts du monde, ne pourra jamais entièrement être résolu. J’aime ce flou dans lequel cela me situe. Qu’est-ce qui te plait dans l’acte de création ? Étienne : Quand je termine de peindre ou de dessiner, je regarde ma production pendant de longues minutes et j’essaye d’en tirer une forme de satisfaction, de fierté. Je vois dans ces jeunes œuvres une surprise, un renouvellement constant. Bien évidemment, je ne suis pas toujours satisfait, mais quand je le suis, alors ça m’excite et ça me pousse pour la suite. Je pense que cette envie de faire plus qui me colle à la peau est le moteur de la création. J’ai toujours envie de créer ce que je ne vois pas, c’est ce qui m’anime. On a cru entendre que tu avais gagné un prix récemment, est-ce que tu peux nous parler de cette expérience ? Étienne : Au mois de février dernier, j’ai gagné le prix Icart Artistik Rezo qui récompense chaque année un projet d’art contemporain. A priori outsider au vu de la concurrence, j’ai eu la chance d’avoir le soutien du jury, composé de nombreuses personnalités liées à la sphère de l’Art. Il faut dire que ce que je fais n’est pas toujours compris par le plus grand nombre, donc j’ai été assez surpris de cet engouement. Est-ce que quand tu crées, tu penses à l’après ? Étienne : Je pense que tout l’intérêt de l’Art et de la création est d’arriver à réinventer sa propre écriture. Si on m’avait dit il y a quelques années que je dessinerais des femmes nues, je n’y aurais pas cru. Pour autant, ce choix s’est fait assez naturellement, sans vouloir ni offenser, ni scandaliser qui que ce soit. Pour moi, l’exploration de nouvelles pistes est un besoin presque vital, même si je suis conscient qu’à l’échelle du monde, tout à déjà été touché du doigt en termes d’images. Je pense qu’il faut davantage se concentrer sur la création d’un univers et d’une cohérence stylistique personnelle. Étienne : Grâce au prix Icart Artistik Rezo, je vais avoir la chance d’exposer une partie de mon travail pendant trois jours à l’Éléphant Paname, du 23 au 25 novembre (10 rue Volney, Paris II). Il s’agit de ma plus grosse installation de céramique : près d’une tonne de matière ! Dans un deuxième temps, la récompense m’a aussi permis de rencontrer Adeline Jeudy. Une semaine après notre rencontre, elle était chez moi, et je lui présentais une partie de mes oeuvres. Le feeling est tout de suite passé entre nous, aussi bien sur le plan artistique que relationnel. Pour moi, c’était un peu nouveau car c’était la première fois qu’une galerie venait découvrir mon travail et montrait un intérêt particulier pour celui-ci. Suite à nos échanges, Adeline m’a proposé de faire ma propre exposition, en solo, au sein de sa galerie et j’ai accepté. 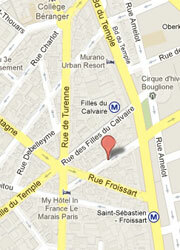 Elle aura lieu du 1er décembre au 12 janvier à la Galerie LJ (12 rue Commines, Paris III). C’est la raison pour laquelle je travaille d’arrache pied depuis six mois. J’essaye de produire un maximum pour que tout soit prêt le moment venu. C’est sur ces dernières paroles que l’entretien s’achève. Étienne nous laisse une dernière fois nous imprégner de la magie qui règne dans son atelier, librement. Chaque oeuvre nous raconte sa propre histoire : télépathie, témoignages graphiques et testaments. Ici, les personnages prennent humblement vie et se plaisent à narrer des anecdotes imaginaires, parfois romantiques, parfois sinistres. Dans ce labyrinthe artistique où le Minotaure est pluriel, nous découvrons un équilibre entre lyrisme et réalisme. Étienne n’est autre qu’un poète moderne qui sculpte des fables à son image, faisant graviter autour de lui un écosystème créatif harmonieux et complexe. 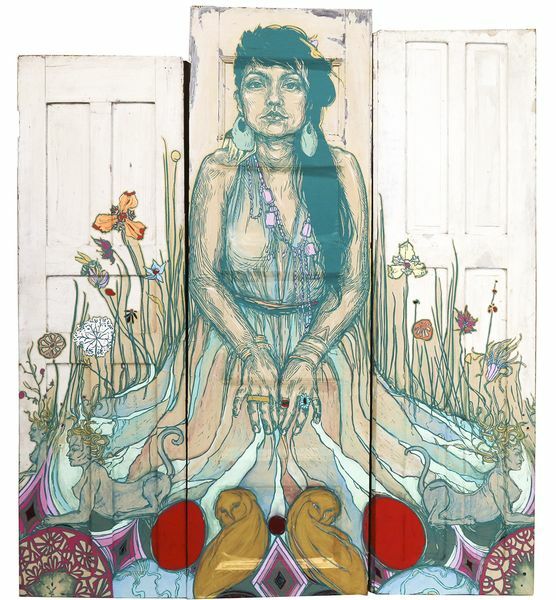 An American mixed-media artist, Swoon is best known for her street art and socially committed projects. 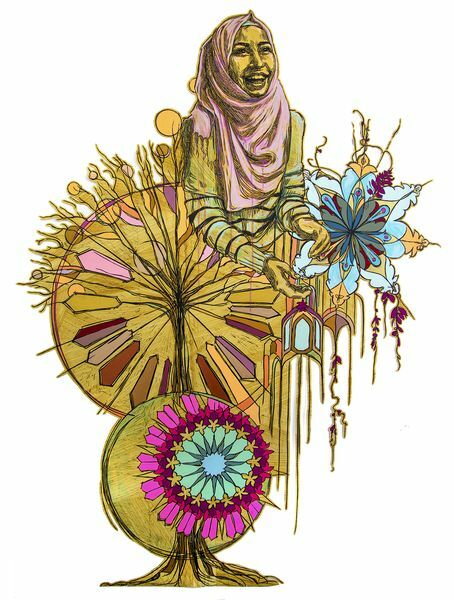 Guided by the belief that art is an immersive, provocative, and transformative experience for its participants, she produces life-size wheatpaste prints and paper cutouts of human figures which reflect her vision of the world. The latest body of work by this humanitarian artist will soon be on view at Galerie LJ in her fourth solo show with the gallery. 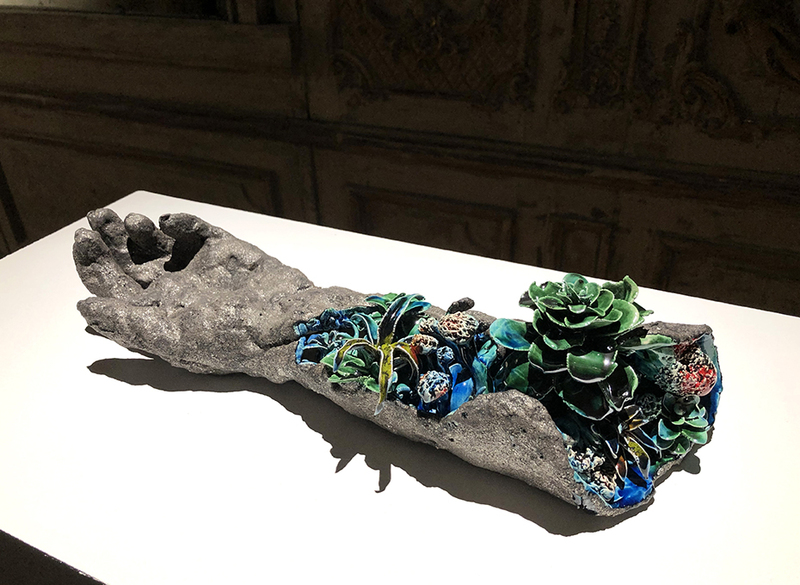 Simply titled New Works, the exhibition will feature a new body of works on mylar, wood, paper, as well as an interactive installation with her newest series composed of customized found jewel boxes offering tiny installations of artworks in 3 dimensions, such as a pop-up book. 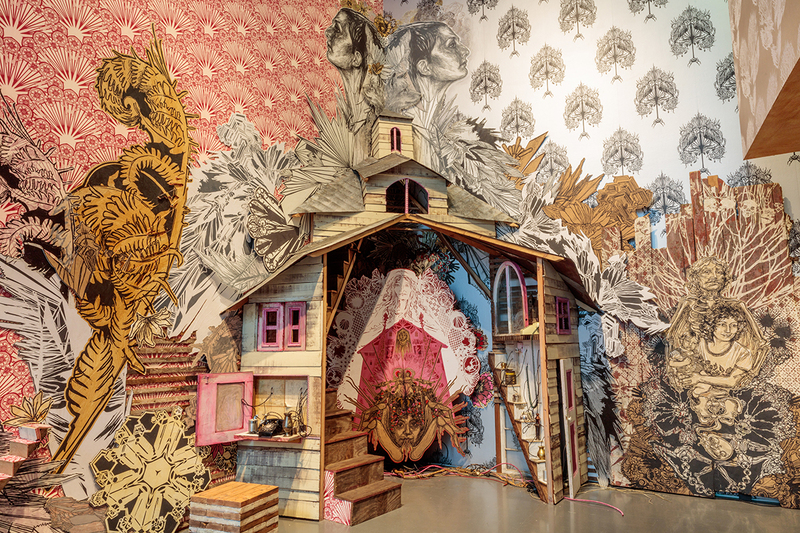 Working in a wide-ranging practice that includes installation and performance, Swoon creates illustrative portraiture which is often politically motivated. 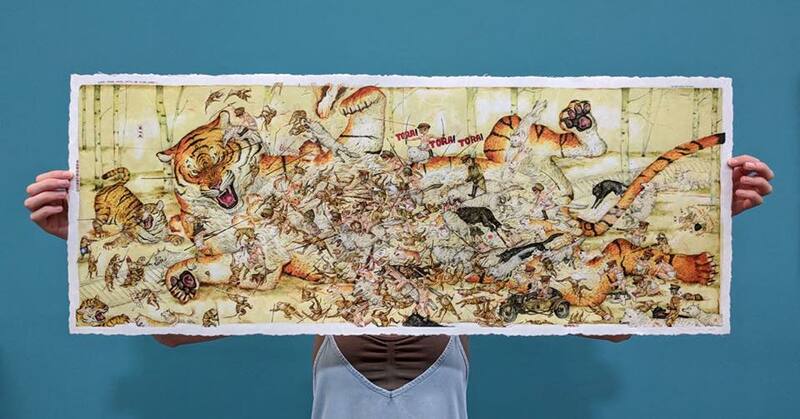 Working with a range of discarded objects as her surface, she produces large-scale images printed on recycled newspaper and glues using wheatpaste, playing with positive and negative forms in a conceptual exploration of the urban environments. 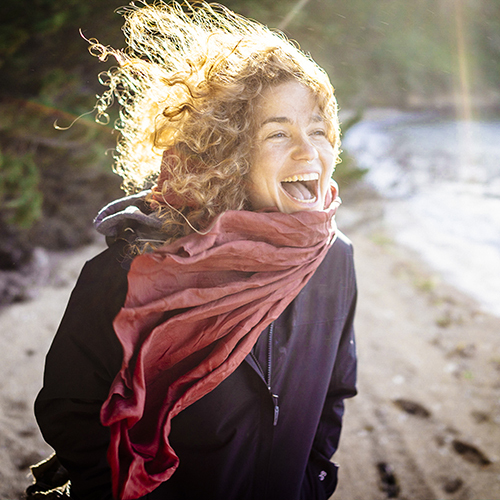 Through her practice, she merges art and activism with the intent of improving the world. She dedicates her life to travel and humanitarian and educational projects. 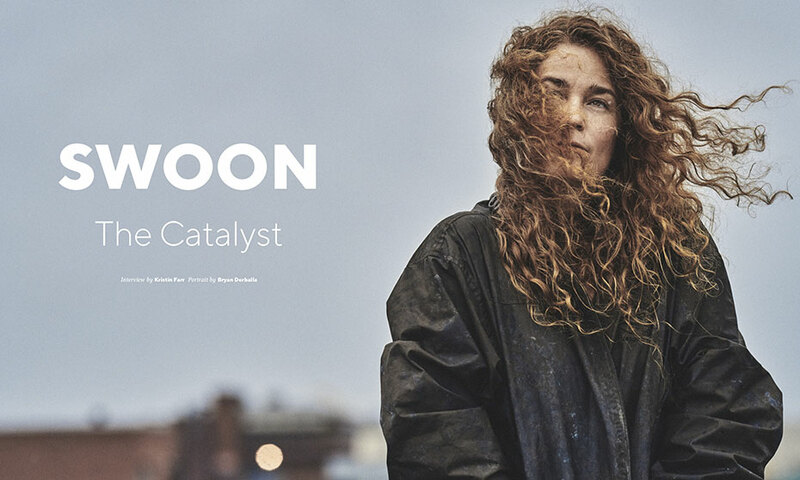 In 2014, Swoon launched her foundation, Heliotrope to gather the 3 non-profit projects she had founded and still runs – Braddock Tiles, Konbit Shelter and Music Box. With her work, she contributed to the reconstruction of New Orleans after Hurricane Katrina and Haiti after the 2010 earthquake. 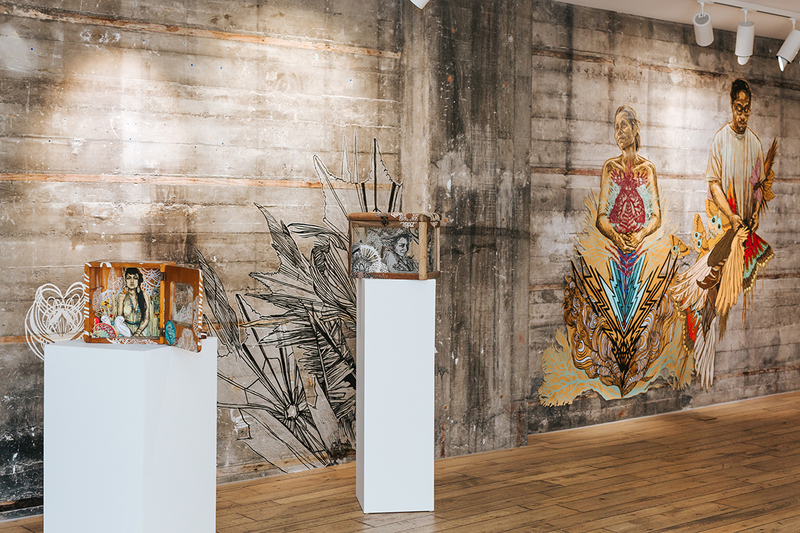 The art of Swoon is a mixture of a range of influences, from German Expressionist prints, Egon Schiele, and Gustav Klimt to Alphonse Mucha, as well as Indonesian shadow puppets and the work of Gordon Matta-Clark. Creating narrative portraits of the people she meets and the cities she visits, she tells a range of compelling stories to the public. These works can often be found as site-specific monumental installations in museums exhibitions. 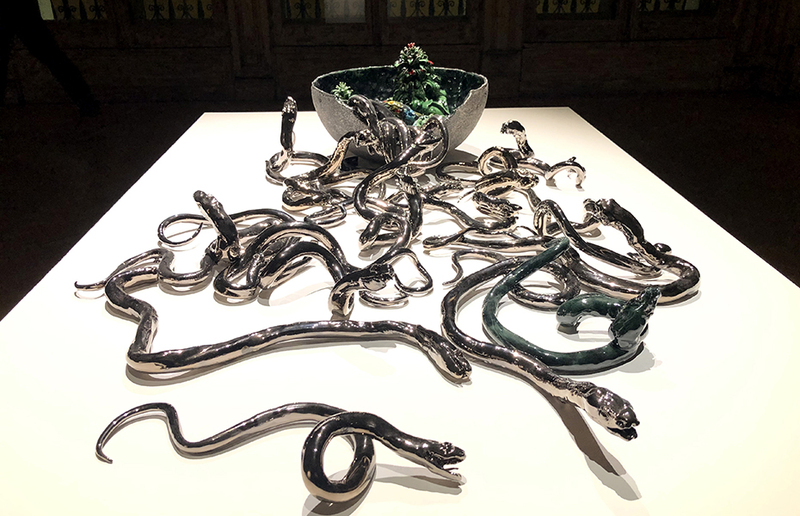 Since the recent loss of her parents, Swoons focuses on more personal topics, such as identity, maternity, heredity, addiction, trauma, empathy, mysticism and spirituality, and catharsis of all these feelings through art. 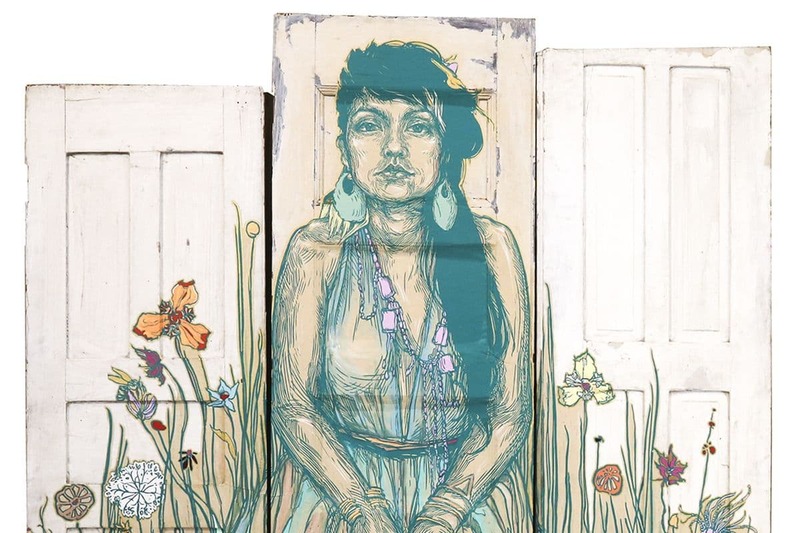 Swoon’s portraits are truly powerful and compelling. They reflect a belief that our bodies and faces store all of our experiences and that a portrait can become a deep insight into those experiences. 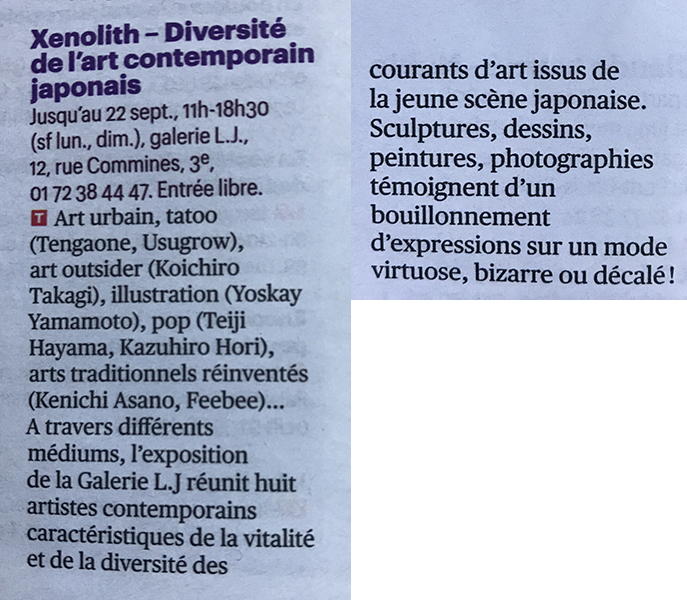 The exhibition New Works will be on view at Galerie LJ in Paris from October 11th until November 24th, 2018. 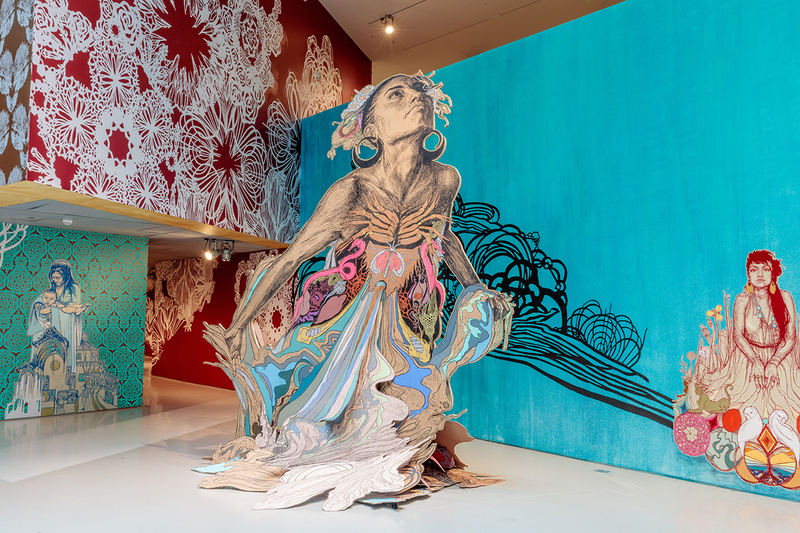 Featured image: Swoon – Moni and the Sphynxes (detail), 2018. All images courtesy of Galerie LJ.